Hair loss is a very common problem. In most cases, hair loss affects men, but in some cases it can affect women as well. Thinning hair often comes from simple aging or hereditary factors, but other causes include hormonal imbalances, malnutrition, certain allergies, pollution, and even physical or emotional stress can also cause hair loss. Poor hair routines and use of the wrong hair care products can also lead to thinning hair. There is no need to spend money on expensive treatments or products. These natural remedies that can improve hair thickness don’t require any expensive items, can be done at home and don’t have the nasty side effects that those expensive treatments do. The key to keeping your hair thick and lush is to avoid anything that might thin it. If your hair is already thinning, you can employ several tricks to make it look fuller. Here are a few examples of what you can do to help pump up the volume. A scalp massage can help stimulate the follicles and make hair grow thicker. Adding these ingredients to a good scalp massage can help. Fenugreek Seeds Tea. Soak 2-3 teaspoons of fenugreek seeds in water for eight to ten hours to form a paste. Apply the paste and leave it there for an hour, then wash it out with lukewarm water. Aloe Vera. Use the gel from these leaves to massage your scalp. Leave it there for one hour, then rinse with lukewarm water. You can also blend aloe vera gel, egg and brandy together into a thick paste, and leave that on for an hour as well. Avocado. Mashed avocado mixed with mashed banana makes a great scalp massage. Leave it in for half an hour, then wash thoroughly with a good shampoo and conditioner. Olive Oil. Massaging the scalp for half an hour before shampooing with a good quality olive oil can help make your hair softer and stronger. If you really want great benefits, leave it in overnight. Flax Seed. Take two or three tablespoons of flax seed and soak them in water for five days. Using a cotton ball, apply the mixture to the scalp. Let it penetrate for ten minutes, then wash it away. Many hair care products are designed to help maintain thick hair or enhance thinner hair. Pay close attention to what you put in your hair! Select Conditioner, Shampoo and Styling Products Carefully. Avoid those that have chemicals and look for organic products instead. Though organic products might mean you must take longer to clean your hair, they don’t contain the chemicals that can harm the hair you have. Note that laureth sulfates and sodium laurel found in many hair products can cause damage to your hair. Avoid Washing Hair Every Day. Washing your hair every day can strip it of vital oils, and that can lead to thinning and unhealthy hair. Most people should only wash their hair two or three times a week. If you have oily hair, three or four times a week should suffice. You can use dry shampoo in between washings if necessary. Apply Essential Oil. Oil such as cedarwood, geranium, lavender, rosemary and thyme can help your hair grow thicker. Apply up to 20 drops of the oil to your scalp, and then work it down through the length of your hair. You can also use a few drops in your shampoo every time you wash your hair. Be Gentle with Your Hair. Use a wide-tooth comb to brush your hair, avoiding the brushes that pull on each strand. Take your time in working out tangles. Take special care with wet hair by only squeezing it dry, and never comb it when it is very wet! Avoid Chemicals and Pollutants. When you are out in a busy place, wear a hat or scarf over your head. When you are in the pool, wear a cap or wash your hair as soon as you get out to protect your hair from the damage of chlorine. Avoid Heating the Hair. Try not to use blow dryers, straighteners or curling irons that often. Using them can dry out the hair and make it very brittle. Apply Egg Mask for Hair. Eggs can provide a ready-made home protein treatment. Use one to two eggs, beat them thoroughly, and then apply it to wet hair for five or ten minutes. Then wash with lukewarm water and a good shampoo. You can do this several times a week if needed. Some over-the-counter hair products are meant to help grow hair thicker and longer. Some of these also stimulate the follicles of your hair, prompting it to produce more strands. Some are easy to use, such as shampoos, while others require taking the time to sit with the solution on your head for a while. Do plenty of research to choose the right one for you, and then follow the directions exactly. The food you put into your body affects all of you, including your hair. It pays to be careful about what you take in! 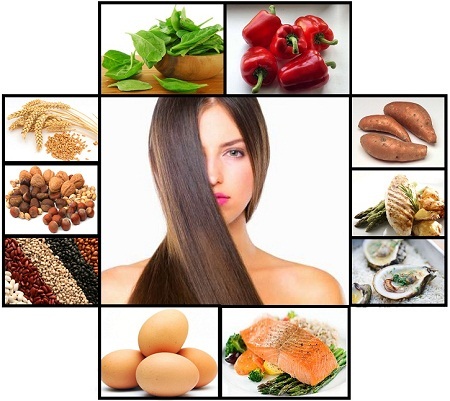 A healthy diet for thicker hair consists of plenty of protein, such as chicken, fish and meats, lots of vitamins, such as those found in vegetables and fruits, and even fat – certain fats can keep hair thick, healthy and shiny. Note than plenty of vitamin B absorption can help a lot in thickening your hair. Eat vitamin B rich foods such as vegetables, fruits brown rice and others. If your hair isn’t responding to any of the home remedies or hair growth products, it might be time to look into other options, such as hair extensions. 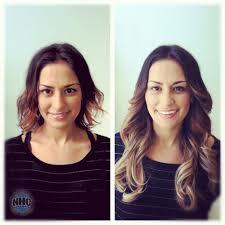 These extensions are attached to your existing hair and make the rest of your hair look fuller and thicker. Hair transplants are also a possibility. This is a surgical procedure in which hair is transplanted to areas of the scalp where the hair is thinning or balding. Though this is traditionally undertaken by men, women might also use the treatment. Speak with your doctor about hair transplants if you feel that might be an option for you.